Mycotoxins are highly toxic chemical byproducts from fungi commonly found in crops, and residual content in foods are regulated the world over. This method package provides simultaneous multi-component analysis conditions for mycotoxins subject to the regulations in Japan, the USA, the EU, and China. 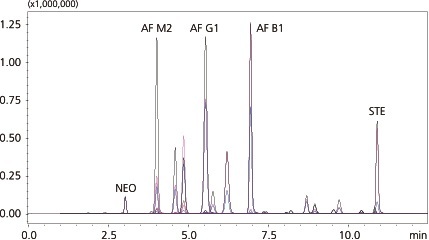 This package contains seven different analytical method conditions and fully optimized MRM transitions for a total of 27 different mycotoxins. 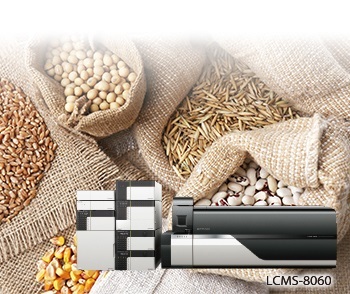 Rapid analytical methods are included for a 25 mycotoxin screen, 16 mycotoxins using high-sensitivity conditions, 10 mycotoxins using APCI, and specialized methods for trichothecenes, fumonisins, aflatoxins, and patulin. * Mastro is a trademark of SHIMADZU GLC Ltd.